There has been lots of progress to celebrate this year at Hobsonville Point, and there’s lots to look forward to after the summer break too. Highlights in this month’s newsletter include a story about the new home of our ‘world famous in the northwest’ Farmer’s Market. The Hobsonville Point Farmers Market has moved into its newly fitted out, purpose-designed home at Catalina Bay and has a new name to mark the change. Click through to find out more. Next year we’ll welcome a new early childhood facility - our second - to the Point. Historic Mill House’s floorboards will once again flex beneath the patter of tiny feet when Bear Park opens in February. If you haven’t been up to the new playground yet at Harrier Point, it really is a gorgeous vantage point from which to view the harbour. In this newsletter we preview the ‘big bird’ about to land at Harrier Point. Our 10m high, pied shag is both sculpture and slide. The art work is taking shape in the workshop and will be installed soon. Finally, read about a Hobsonville Point resident’s goal of living a zero-waste life, and pick up some tips on how to cut back on your contribution to landfill. In the August 2017 issue of the Hobsonville Point newsletter, we mark how far our community has come, and look back at our past. Last month, the owners of Hobsonville Point’s 1000th house were welcomed to our growing village. So far, 1,600 homes have been sold, with a further 630 planned. Works are also well underway at Catalina Bay and expected to be completed next year. Amidst all this growth, we’re celebrating our history, with an event planned as part of October’s Auckland Heritage Festival, featuring talks aboard a charter ferry ride from the Hobsonville Point ferry terminal. The upgrade of the historic Chichester Cottage has also begun, to ready it for community use. And artwork from the former Hobsonville North Kindergarten are once again on public display, in its new permanent home alongside the Hobsonville Point Coastal Walkway/Te Ara Manawa. Hobsonville Point’s waterfront at Catalina Bay is undergoing a dramatic transformation and this month we take a closer look at the exciting plans for this spectacular location. We also check in around the development for updates on Harrier Point Park, the former Rifle Range, the Coastal Walkway/Te Ara Manawa and the Marlborough and Airfield precincts. With so much happening at The Point and elsewhere in Auckland, we learn about Hobsonville Land Company’s expanded focus and renewed name. And for residents and visitors alike, we take a look at what is on offer in the area. From a new café to a new work of art in the making, a fun run for all the family, how to drive away in a communal car and where to go for information from the Hobsonville Point Residents Society, this April issue has something for everyone. ‘Tis the season to be giving so this month we take a look at projects benefiting children’s charities. We also feature a story on the gifting of Chichester Cottage to the local residents’ society and outline how it will become an asset for the community from next year. The new year also promises other exciting changes at Hobsonville Point. We reveal plans for the Marlborough Precinct and The Landing, as well as the progress of the coastal walkway, Te Ara Manawa. And as you’d expect from a Christmas issue, we also feature something to tempt your taste buds, with stories on the development’s latest food offerings – an Indian restaurant and a home-baking business specializing in custom cakes. This month we dive into detail and explore a selection of stories from the growing community that is Hobsonville Point. We take a look at some of the projects that are keeping our school students busy, learn more about the various retail and recreational offerings available in the area, and hear from some residents who have turned their daily commute into a relaxing ride, thanks to the public bus. We also check in on the development’s progress, with updates on the Bernoulli Gardens project and the Airfields Precinct. 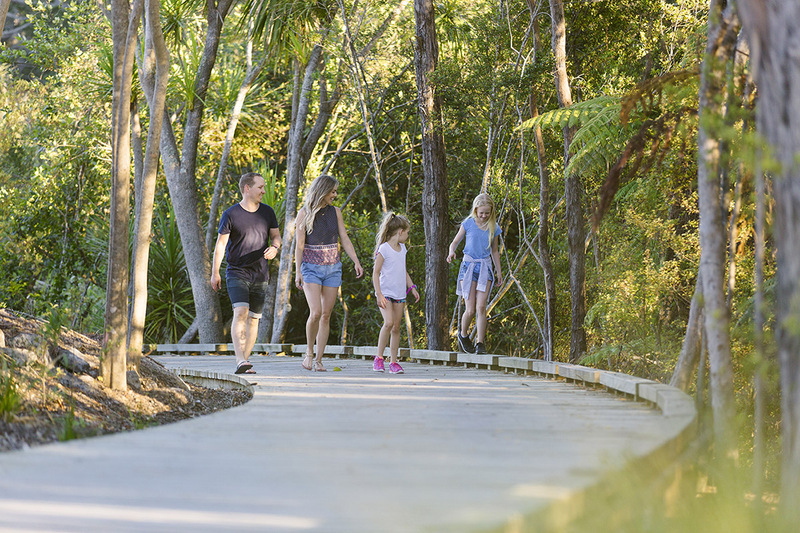 And we learn about the development of the Catalina Precinct spine road, which, in a New Zealand first, will feature a water-themed play trail, bird houses and other features designed to encourage passers by to journey, gather, interact and rest. 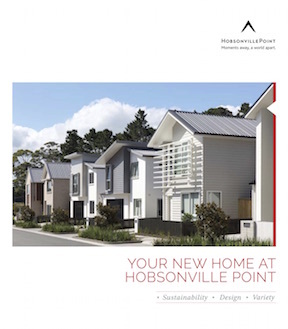 Hobsonville Land Company’s Sustainability Report for 2014/15 is complete and we have some pleasing results to share about Hobsonville Point. Check out the May newsletter to see how we are going with electricity and water use, biodiversity, car usage and more. We also take a closer look at other aspects of the development including how to fire up on fibre, what becomes of our construction and demolition waste and how one of the area’s grand old homes is getting a new lease on life. As ever, there is plenty to enjoy onsite too. Read on for details of the up and coming Runway Challenge, some exciting outdoor projects that are currently in the pipeline and the new shops that are open for business in the Brickworks buildings. 2015 was a big year at Hobsonville Point, and 2016 promises to be another big year. This issue covers some of the milestones reached last year, and what this year will bring. Read about the oral history project and plans for the redevelopment of The Landing. Hobsonville Point is an area steeped in history and it is this rich heritage which will again be celebrated as part of the Auckland-wide Heritage Festival. September’s newsletter has details of the event, which will include a photographic exhibition and a talk from the ‘Hobsonville Old Boys’, residents of the airbase which once occupied the area. Meanwhile, there have been some exciting additions to this growing community. We take a look at some of the businesses which have opened on the ground floor of the Brickwork Apartments, the new woof wash for pampering four-legged friends, and local sailing and cricket opportunities. We are also delighted to share the progress being made on Hobsonville Point’s two newest neighbourhoods, which will see hundreds of homes brought to market for people wanting to be part of this very special development. This month we take a look at developments happening across Hobsonville Point, including the new car sharing scheme Cityhop, the new Information Centre, a new public art installation and other improvements along the historic Buckley Avenue, and progress on key infrastructure works. And while the development continues at pace, we check in with students from the local primary and secondary schools who are busy preserving the past while also looking to the future. Next month brings with it the fifth Hobsonville Point Runway Challenge, so it’s time to get your team together and your running shoes on. The annual challenge raises money for worthy local causes from the entry fees of participants, who can complete a 3, 5 or 10km course with voluntary obstacles along the way. April’s newsletter has more information on the event and details of how to register. We also take a look at how the sense of community is building at Hobsonville Point with numerous events, a shared celebration for the two schools and neighbours socializing together all taking place over Summer. Hobsonville Point has lots to enjoy together over the coming months too, with a new artwork installed, an early learning centre being built, more new homes released and the chance to meet the faces behind the legendary Farmers Market. In the six months that the Axis Series Small Home Test Lab was open to the public, thousands of people came to view them. Over 2,000 visitors gave feedback on the homes. October’s newsletter reports on the feedback, and you’ll be surprised by the results! 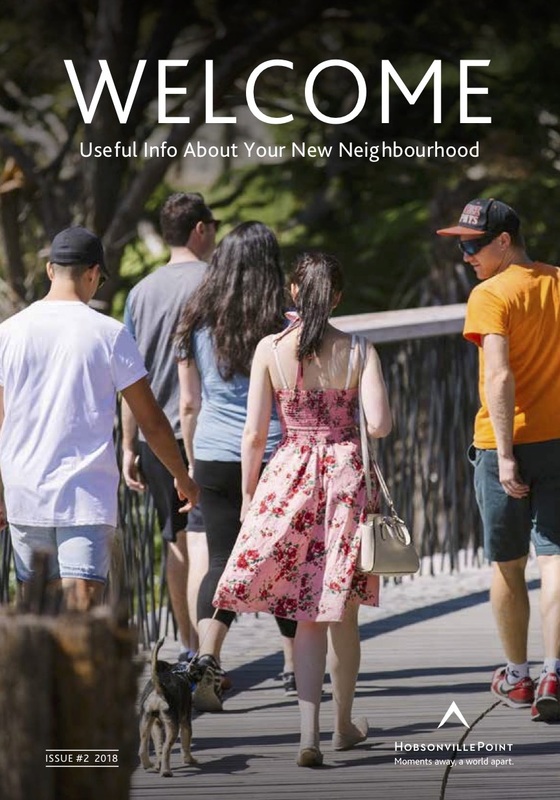 The newsletter also introduces the new homes coming to Hobsonville Point Road, including ‘walk-ups’, which are new to New Zealand but popular overseas. There’s a fantastic scholarship available to students aged 8-18 year olds, and read about upcoming events at Hobsonville Point. Hobsonville Point will have a brand new Early Learning Centre from around June/July 2015. This will be located on the grounds of the Hobsonville Point Primary School. They will have a temporary facility from the end of this year for over three year olds, so read on to find out more. Concept Plans for the Coastal Linear Park were presented to residents last month, there is great excitement about this 4km walkway that will feature play, art, and reference the heritage of this special place. If you are into art, knitting, planting, cycling or eating, there’s something in this newsletter for you! 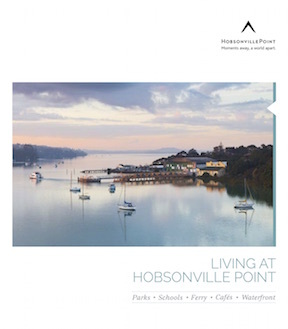 2014 is proving to be a busy year for Hobsonville Point. This newsletter highlights what has been happening so far, and what’s coming up. Find out about the Small Home Test Labs that are now open for viewing, there’s a new Potters Market that has started up next to the Farmers Market, and the annual Hobsonville Point Runway Challenge is open for registration, so don’t miss out! Still to come this year is the installation of a number of fantastic artworks, the restoration of the Sunderland Avenue homes, and further construction of the coastal linear park. 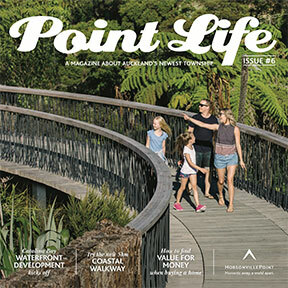 The last issue for 2013 has exciting news about the Hobsonville Point Farmers Market moving to the Landing next year. Alongside the market, there will be plenty of family-friendly outdoor events taking place. Find out what a recent survey of our residents has to say about life at Hobsonville Point, and you'll read about plans for the retirement village. A new fund has been launched to help the Hobsonville Point Community to development and carry out an activity, event or community service, find out how you can access this. In Hobsonville Point's October newsletter there is news about plans for an Early Childhood Education centre coming to the Hobsonville Point Primary School, and be in with a chance to win a $200 Rebel Sport voucher as we launch our 'Nextbike' rental bikes! We also welcome you to visit two new showhomes. One is Tasman Cook's sales suite for the 'Brickworks' apartments, and the other is Classic Builders, both will be open seven days a week. We congratulate the Hobsonville Point Farmers Market stallholders that were winners at the Annual National Farmers Markets Awards. In our eighth annual issue of Point Life we celebrate the opening of the refurbished Sunderland Hangar with its wonderful new restaurants and Little Creatures microbrewery. Read about the opening of Te Ara Manawa, the Hobsonville/Onekiritea coastal walkway. 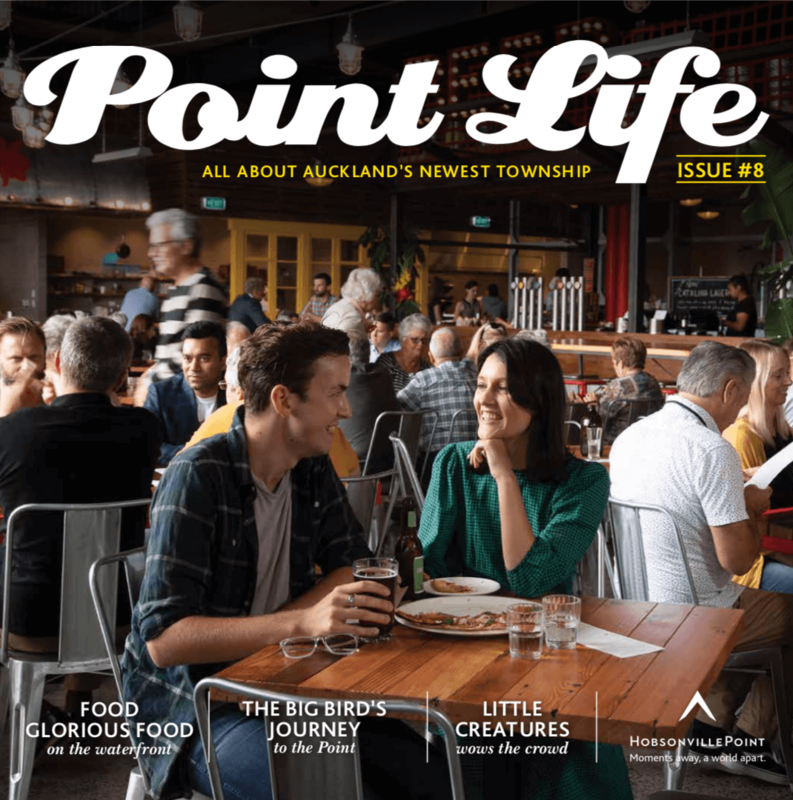 Plus author and Hobsonville Point resident Lindsey Dawson talks with Point Lifeabout what it’s like to move to a new community and get involved in shaping it. Finally, get a sneak preview of the enormous bird about to land in one our parks. Sculptor Philipp Meier’s 10m high corten steel pied shag will double as a viewing platform and slide for the kids. 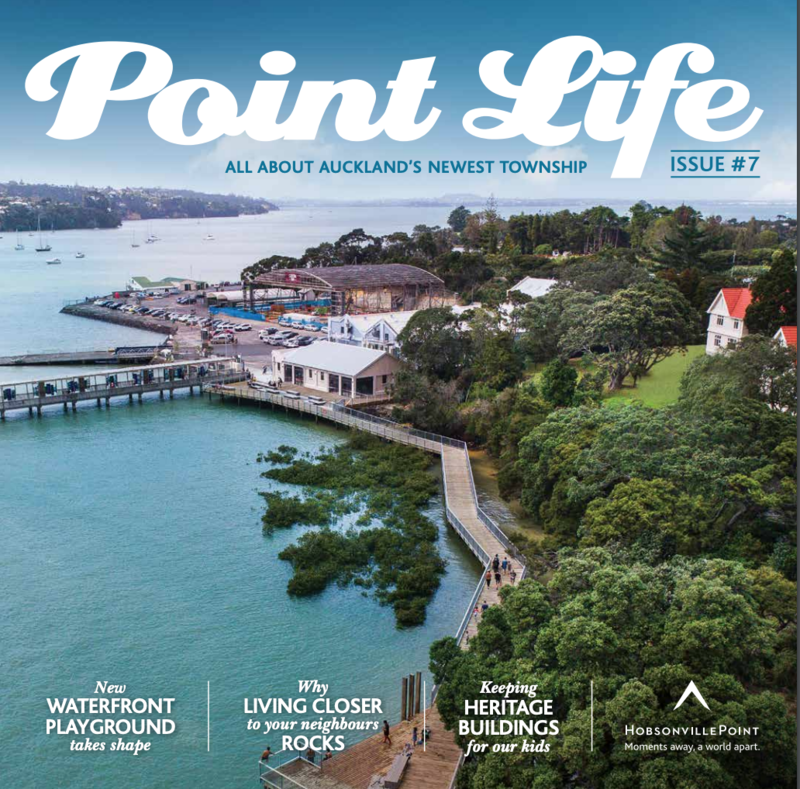 In our seventh issue of Point Life we chat with Willis Bond & Co’s Project Director for Catalina Bay, Wayne Silver, about the importance of preserving heritage and the need to adapt our community’s oldest buildings for modern use. Learn about the unexpected benefits of ‘sizing down’, and how shared spaces, parks and walkways increase social capital. Got weekend plans? Issue seven has you covered with a detailed list of weekend activities at your fingertips, all within 30 minutes of home. Finally, check out the figures from our latest sustainability report. 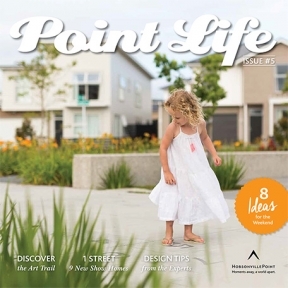 In our sixth issue of Point Life we announce the first stage of development at Catalina Bay. Read about plans to refurbish and adapt our heritage buildings to create an exciting waterfront hospitality precinct. We also detail some of the highlights of Te Ara Manawa, one of the city's best walks. This 5km loop encircles Hobsonville Point, winding through neighbourhoods and bush and alongside the coast. In the market for a new home? Find out what makes people happiest in their home and their neighbourhood, and put the knowledge to use so you can achieve value for money when you buy. In our fifth annual issue of you can read all about how the community is shaping up. We feature our street of show homes and share some interior design tips from their designers. Get a sense of what it's like to live here from interviews with some of our residents and collect some ideas for things to see and do when you visit. Click here to read on-screen or download it for later. In our fourth issue we invite you to explore these pages then come and explore the peninsula. We think you might be surprised at the scale of the development, and - between the walks, the fabulous food, the harbour, the public art, the show homes, and the parks and the playgrounds - we feel pretty confident that there's plenty here you'll enjoy. 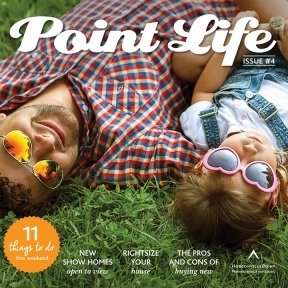 Click here to read Point Life on-screen or download it for later. 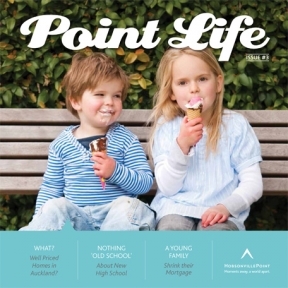 The third issue of our annual magazine, Point Life, is out now. Read all about the big plans we have for Hobsonville Point, the progress we've made so far, and what it's like to live here. Click here to read Point Life on-screen or download it for later. When we published our first issue of Point Life 12 months ago we made some bold promises about what we would deliver and by when. Click here to read on-screen about how far we've come or download it for later. 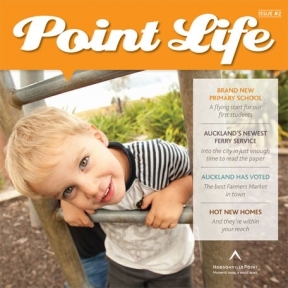 Welcome to Point Life, a new magazine created to let you in on Auckland's best-kept secret. Building has begun on what will be a sensational harbourside community comprising around 2,500 homes in a thriving community. 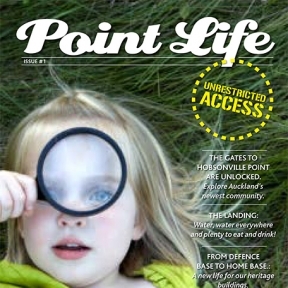 Click here to read Point Life on-screen or download it for later. 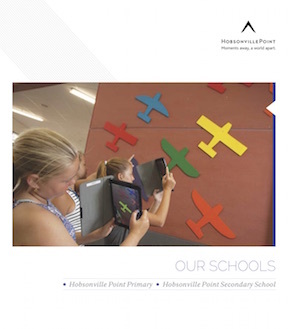 An in-depth guide to our two new state schools, Hobsonville Point Primary and Hobsonville Point Secondary School. Read how every new home at Hobsonville Point has been designed to maximise space, minimise power bills, and keep you connected with nature and your community. This brochure will give you a sense of what it's like to belong to the community, and show you how it has been designed to help everyone feel involved. 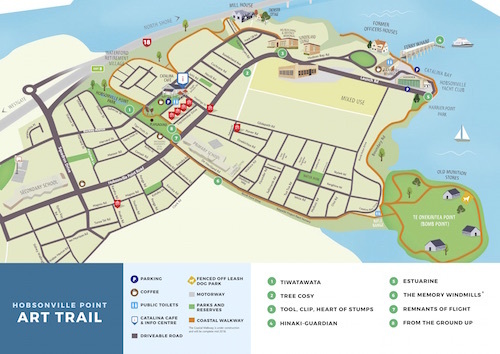 This document contains the route map and progress schedule for the partially completed 4km walkway that will hug the water's edge around two thirds of Hobsonville Point and cross the site at Hobsonville Point Park in order to form a loop. Our ninth annual sustainability report is now available. This report tracks our progress against performance indicators and comments on achievements and challenges over the last year. Our eighth annual sustainability report is now available. This year is the seventh year of reporting against the Sustainable Development Framework that was developed at the very beginning of the development process. The reporting framework clearly articulates the vision, goals and objectives for Hobsonville Point. A report on the feedback cards filled in by visitors to Hobsonville Point's Small Home Test Lab. This framework outlines the overarching vision for the development in detail. It includes objectives, goals, indicators and targets in the four spheres of environment, economic, social and cultural. It is reported against annually. Our sixth annual sustainability report is now available. This year we also put together a short video you can watch on our Living Sustainably page that tells our sustainability journey in five and a half minutes. 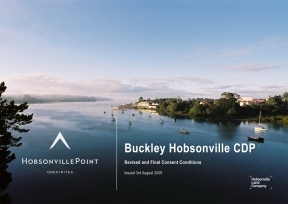 In 2007 the Hobsonville Land Company adopted a Sustainable Development Framework for Hobsonville Point. This framework guides us as we work towards our vision of building a strong, vibrant community that sets new benchmarks for quality and accessible urban development with an environmentally responsible focus. This is our fifth annual report against the framework. Our fourth Corporate Responsibility Report covers the July 2010 – June 2011 period. In the past year, we have welcomed our first residents in the Buckley precinct. Consents have been obtained for the required coastal structures, including the ferry wharf, and design work for this is already under way. This report reflects our focus on the placemaking aspects of sustainability, and the actions that we need to take to help this community flourish and to develop a sense of belonging at Hobsonville Point. This report tracks our progress against performance indicators and comments on achievements and challenges over the last year. It includes our annual carbon account and looks at the way we conduct our business as well as the performance of the Hobsonville Point project. With the first development stage now underway and house construction about to start we are starting to see the implementation of many of the features that have been planned for several years. This report documents our performance against various indicators in the past year and provides a useful insight into our vision and approach. The Framework Plan provides a roadmap for development which ensures that the existing high quality of development is maintained whilst ensuring flexibility and recognising the uniqueness of the Buckley B precinct. This Framework Plan is designed to guide the development of a high quality urban form for the Hobsonville Point Village precinct. 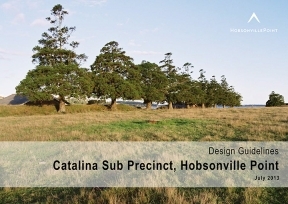 The Design Guidelines articulate the development vision for the Catalina Precinct, and prompt a considered design response to all subsequent development. They explain the character and standard of the detailed design that is expected of individual buildings and landscapes, while allowing flexibility and innovation. The design guidelines are administered by a design panel empowered to evaluate and make recommendations to achieve overall design objectives for the development. 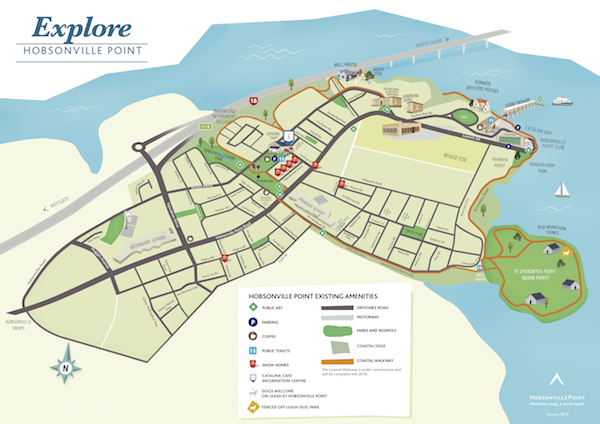 The Hobsonville Point Chromatic Reference Plan has been created to support the Design Guides and is a reference tool for the builder partners and their design consultants. This document sets out principles, guidelines, rules of thumb and case studies in order to facilitate variation of colour in built form. This is to be used in conjunction with the Hobsonville Point Chromatic Reference Plan. Hobsonville Point Road has been designed to form the spine of our community, carrying traffic and pedestrians down to The Landing on the waterfront. 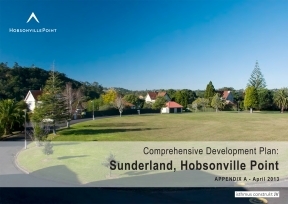 The Sunderland Comprehensive Development Plan defines the development controls and design guidelines for the Sunderland Precinct which covers the north-eastern part of Hobsonville Point. The Comprehensive Development Plan Consent has been granted by Auckland Council and this document reflects the conditions of this consent. It is however noted that this document has not yet been approved by Council in its final form. The design guide controls architectural and development quality, including front yard landscaping. It interprets and gives effect to the design code, providing a degree of certainty for the “look and feel” of the development, while also encouraging variety and interest within the built form and landscape. The design guide is administered by a design panel empowered to evaluate and make recommendations to achieve overall design objectives for the development. This statutory document is a design code that outlines the overarching conditions that have to be complied with in the comprehensive development area (Buckley and Buckley B). Its role is to ensure consistency of urban form and character, and to set out controls for buildings, streets and open space. 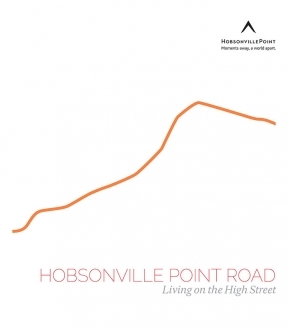 This booklet provides you with details of, and contact information for, the services and activities available within Hobsonville Point and nearby. There's also a few things you need to know about joining a community where nearby areas may still be under construction. If you want to make an addition or alteration to your home you need to make sure the work complies with the rules set out by Auckland Council and the Hobsonville Point Residents Society rules. 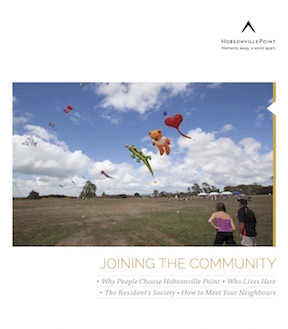 The Hobsonville Point Residents Society's website outlines the process here. All owners must be members of the Hobsonville Point Residents Society. You can find the Residents Society rules here. Waste collection at Hobsonville Point is on Thursdays. Please see the Auckland Council Rubbish and Recycling website for more information and to order bins. 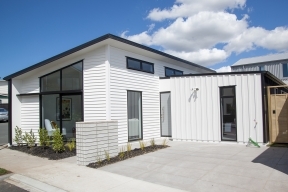 In early 2014 we built three compact, architect-designed homes at Hobsonville Point. The strong overall positive feedback we received in our visitor survey challenged the commonly-held view that the market wants bigger homes.